← Seeing the Bigger Picture? Do you have eagle eyes? 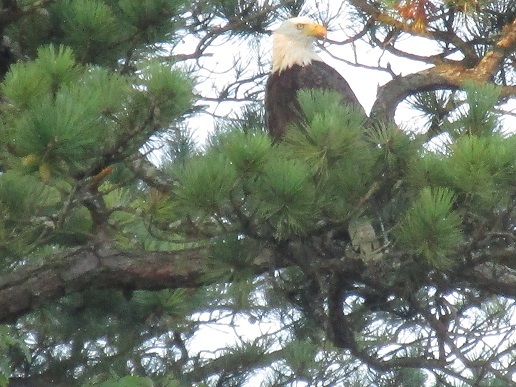 Our kayaking friend made his presence known again this past weekend, roosting in one of his favorite spots. Isn’t it amazing how, when we’re focused on seeing something, we can see? Isn’t it crazy how when we aren’t as focused or aware, we don’t always see what may be right in front of us? This eagle has been a focus for us since he made his debut on our first kayak outing earlier this year. So far, he only missed one visit, this past Sunday. My expectations are he should be there, I should be able to see him and I should be able to snap some gorgeous pictures. The believe that I ‘should’ isn’t the way I want to live my life. My rigid expectations could have made me a prisoner to those beliefs…I should…I should…I should. My foolish ideas could have crowded out my enjoyment of where I was and what I was doing. I’ve decided to adopt the word ‘could‘ instead. I could see him, I could get a good picture. The difference in wording doesn’t seem like a big deal, but it really is. Amazingly, it reduces my self-imposed anxiety and restores an element of surprise and enjoyment to my outings. Instead of thinking I should, I’ll rely on my eagle eyes to catch the white feathers and enjoy the process along the way. Kathy Ruff is a seasoned, freelance business and inspirational writer and author of the Sharing Peace on the Path blog.